The Rev. 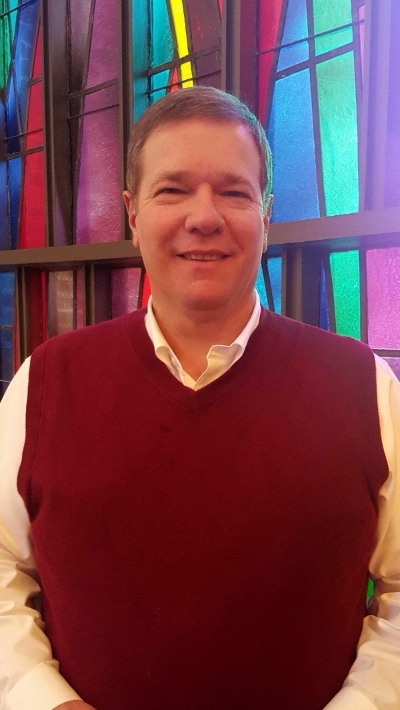 John Fitzgerald is the Senior Pastor of First United Methodist Church in High Point. He grew up in High Point from 1970-1979, attending Johnson Street and Northwood Elementary Schools. John attended Ferndale Middle School (formerly junior high) and High Point Central High School. He moved his senior year and graduated from Asheville High School. John attended Appalachian State University where he received his B.S. degree in Industrial Psychology. He matriculated to Duke Divinity School where he received his M.Div. in 1989. John has been a part of the Reynolds Program where he has traveled around the country and world studying successful churches. He has served Hebron UMC in Monroe, Center UMC in Greensboro, Yadkinville UMC, Covenant Church United Methodist in High Point, Boone UMC, and, most recently, Providence UMC in Charlotte. John enjoys playing the fiddle and bluegrass music, fly fishing, relaxing in the mountains, woodworking, and amateur art. John’s wife, Christine Alexander Fitzgerald, who goes by Chris (not to be confused with John’s cousin and our former pastor Chris Fitzgerald!) is a native of Charlotte and a graduate of Brenau University. They have two grown sons: Ben, who is getting married in July, and Alex, who graduated from Appalachian State University in May of this year. Pastor John considers the move to First UMC coming home and a wonderful opportunity to reconnect with the town he loves. He and his family look forward to many years here!